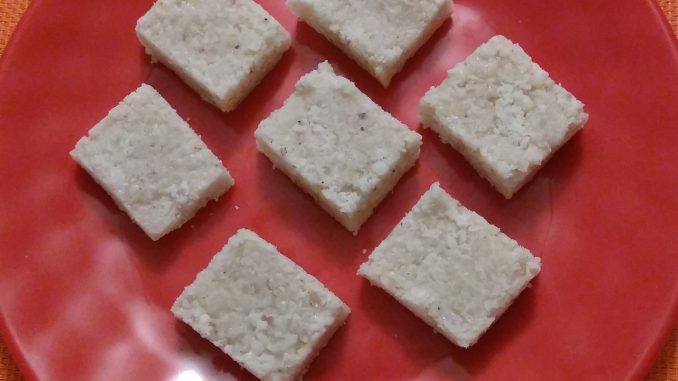 Coconut Burfi is a popular sweet in most parts on India. 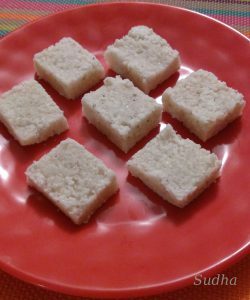 There are different recipes of coconut burfi. This one is a Maharashtrian Recipe that requires very few ingredients that are generally available in the kitchen and makes delicious burfi. This does not use Mava / Mawa (Thickened Milk) nor condensed milk. 1. In a heavy bottom pan, add coconut, sugar, milk. Keep cooking on low flame stirring all the time. 2. When mixture starts thickening, add salt and dry fruit powder. 4. Keep a greased plate ready for spreading the mixture. 5. When mixture starts coming together, add ghee and Cardamom powder. Mix. 6. Transfer the mixture to the greased plate and spread evenly. 7. When mixture is warm, cut pieces of desired shape and size. 8. Serve this delicious Burfi. Do not store Naralachya Vadya in refrigerator. It can be stored for 4-5 days without refrigeration. For getting nice white colour burfi, use only the white part of coconut. Remaining brown part of coconut to be scraped separately. It can be used for Subji / Chutney. नारळाच्या वड्या (नारळीपाक) ही एक लोकप्रिय पाककृती आहे. भारतात वेगवेगळ्या प्रदेशात वेगवेगळ्या प्रकारे ह्या वड्या बनवल्या जातात. ही रेसिपी महाराष्ट्रात कोकणात बनवली जाणारी आहे. अतिशय सोपी पाककृती मावा / कंडेन्सड मिल्क न वापरता घरात नेहमी असणारे जिन्नस वापरून बनवलेली रेसिपी आहे. १. एका जाड बुडाच्या पातेल्यात नारळ, साखर, दूध एकत्र करून मंद आचेवर शिजवा. एकसारखं ढवळत राहा. २. मिश्रण घट्ट होत आलं की त्यात मीठ, सुक्या मेव्याची पावडर घाला. ४. मिश्रण कडा सोडायला लागलं की तूप आणि वेलची पूड घालून एकजीव करा आणि लगेच तूप लावलेल्या ताटलीत घालून पसरा. ५. मिश्रण कोमट असताना वड्या पाडा. ह्या वड्या ४–५ दिवस फ्रिज बाहेर टिकतात. फ्रिज मध्ये ठेवू नका. १. पांढऱ्या शुभ्र वड्या होण्यासाठी नारळ खरवडताना काळा भाग घेऊ नका. काळा भाग वेगळा खरवडून भाजी / आमटी साठी वापरा. Sudha, I visited your food blog shortly which has been meticulously designed. Very simple and neat! Have tried out the flax seeds chutney for tonight’s dinner. It tastes awesome. What I super liked is that your recipes are healthy! Keep up the good work! Next step to get to see you on YouTube. With your passion may this venture get you to places! Good luck!! Thank you so much, Geeta for your feedback. I would appreciate if you can comment on the recipes after you try them. Please also try other recipes. Thanks once again.